To date The Duct Tape Guys have written five bestselling humor books about a product near and dear to everyone's heart: Duct Tape. And, as if that weren't enough, they've developed a hilariously bizarre prop comedy act about the same seemingly mundane topic. Their books have sold over one million copies, and audiences all over North America, Germany, and England have enjoyed their patented brand of "intelligent stupidity." Now, they're pleased to make their delightfully wacky (yet totally clean) comedy available to corporate audiences. The Duct Tape Guys couldn't have written five books and eight 365 Days of Duct Tape calendars without having a firm grasp on the creative process. Tim, the brainchild behind the Duct Tape Book genre, is a twenty-five-plus year veteran of the advertising and marketing industry and thrives on creativity. If your event allows for a discussion about the creative process, Tim would be happy to oblige. Simply book in extra time (up to an hour) for a talk about creative and brainstorming. Your attendees will come away from the event with usable creativity tools to make them more productive in their own job niche. We suggest starting with our stage show, breaking for lunch or coffee, then spending an additional hour discovering the creative techniques that they've used to concoct over 5,000 uses for duct tape. When you book the Duct Tape Guys for your corporate event, they will allow you one FREE performance to donate to a local school or church group if scheduled the same day as your event. Not only offer does this allow for some great PR for your company, it allows "financially impared" organizations to be able to enjoy The Duct Tape Guys as well. The cost for the Duct Tape Guys is $3900.00* per day plus travel expenses (airfare and lodging as required). Travel days are billed at a partial rate (call to discuss). An invoice will be sent for 50% down to secure the date and 50% at the event. Payments are made to Octane Creative (a dba of Tim Nyberg Creative, Inc., a Minnesota corporation). *If you want a customized show, the cost will be slightly higher (see below). Just how DO you sell over a million books? If you don't have a name like Grisham, it helps if you've nailed a popular topic (like duct tape). Other than that, The Duct Tape Guys have relied on what Tim calls "Monkey Marketing (tm)" - Creating massive marketing reach on the thinnest shoestring you've ever seen and by breaking (or totally ignoring) the "rules". In an hour seminar Tim will outline the unconventional methods he used to propel a small book from a small publisher to best seller status. This information is documented in a book that each attendee will receive at the event. Note: The additional cost for the "Monkey Marketing" mini seminar is an cost based on number attending and includes a copy of "The Monkey Marketing Book" for each attendee. As one of the worldÕs leading materials suppliers with a well-known and respected brand name, we are often faced with telling our story in new, fresh, fun ways.Ê This was the greatest challenge we faced in preparing for our largest US trade show: NPE 2006 International Plastics Expo in Chicago, Illinois. Enter Tim Nyberg and Jim Berg Ð more famously known as ÒThe Duct Tape Guys.Ó ÊTheir website, books and calendars have been shared and passed around the engineering crowd both at our facility and at customerÕs facilities, giving us a common-ground starting point from which we could draw humor and generate curiosity. 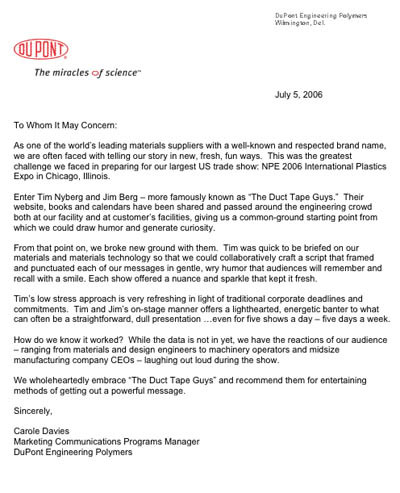 From that point on, we broke new ground with them.Ê Tim was quick to be briefed on our materials and materials technology so that we could collaboratively craft a script that framed and punctuated each of our messages in gentle, wry humor that audiences will remember and recall with a smile. Each show offered a nuance and sparkle that kept it fresh. Your corporation may also benefit from a Duct Tape Guy Creativity Seminar. Click here for more information. Sure, a gal in a skimpy outfit can get the guys to oogle and drool all over your booth, but can it get them informed with your product line and entertain them at the same time? 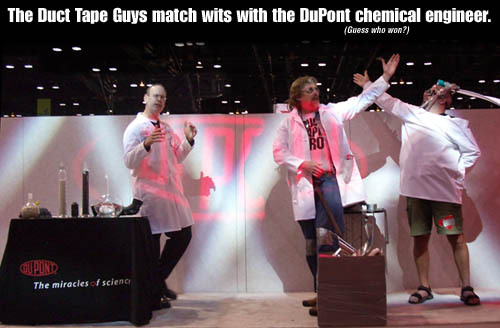 We can custom tailor a show for you just like we did for DuPont's Engineering Polymers division at the 2006 International Plastics Expo in Chicago. For 30 years, Tim has been working with advertising agencies, marketing firms and directly with businesses creating unique and memorable marketing. His creativity and writing ability allows him to take your information and infuse it with Duct Tape Guy humor to make for some incredibly unique booth draw for your trade shows or to spice up your next boring sales meeting.